Last February, I embarked in sail vessel 'Guga Buy' of Eduardo Zanella, which was in Ushuaia, for some exploration of the fjords, glaciers, pinguineras, castoreiras, among others, to acquire background with navigation in high latitudes. Having made the crossing from the Cape of Good Hope in January of 2012 during my circumnavigation in 'Matajusi', my sailing vessel, I was interested in new explorations. Patagonia could be a good next option, but one should study that area in great detail beforehand. The best form of studying that area would be to embark in a sailing boat prepared for high latitudes, and thus, I enrolled in a 15-day program to navigate in Patagonia. We waited, and we got ready for, much more extreme conditions than what we actually encountered, and so we had some time left. By pure coincidence, we became aware of the first regatta around Cape Horn. It did not take much time for us to decide to join the other boats enrolled! We navigated to Port Williams, the place of the start of the regatta, and we joined the other six boats registered in the first regatta of that type in that area. The start of the regatta was on 10th of March, and, after some nights of wine, cachaça drinks, and a lot of barbecue, we started from Port Williams and navigated 25 miles until Port Toro, the most southern village of the world. We took second place in that leg of the regatta. Arriving in Porto Toro, we had another night of wine, cachaça and barbecue, and the following day, started to navigate 23 miles more, until the arrival line of the 2nd leg of the regatta, in the Terhalten Isl. From there, we navigated 24 more miles until Herschel Isl, anchoring overnight in Martial Bay, a reasonably protected bay at the NE side of the Island. We again took second place in this second leg of the regatta. The following morning, we navigated to the south side of the Horn Isl, to start the third leg of the regatta, this time, navigating around Horn Island. Without knowing the format of that regatta well, we navigated until Cape Horn, and arriving there, the start of the regatta was signalled. We were south of the other boats, and we did not start well, but, at the halfway point of the island, we were already second again. After that, we had to quit our participation in the First Circumnavigation regatta of Cabo Horn, returning to Port Williams, as we had a flight to catch in two days! Of the other boats, the Japanese, also abandoned after the round Horn leg, and headed to South Africa. The other boats, proceeded with the regatta until the last leg, and returned to Port Williams. Everything went well, and a ship of the Chilean Navy accompanied us the whole time. The sea and wind conditions were exceptionally good! View Silvio's fantastic photos on the gallery of the OCC website. Follow the link below. Editor's Note: A major regatta is planned for 2019-2020 from Gibraltar to Cape Horn in stages. It is being organised by Alec Honey who raced as navigator in the first Whitbread Around the World Race. 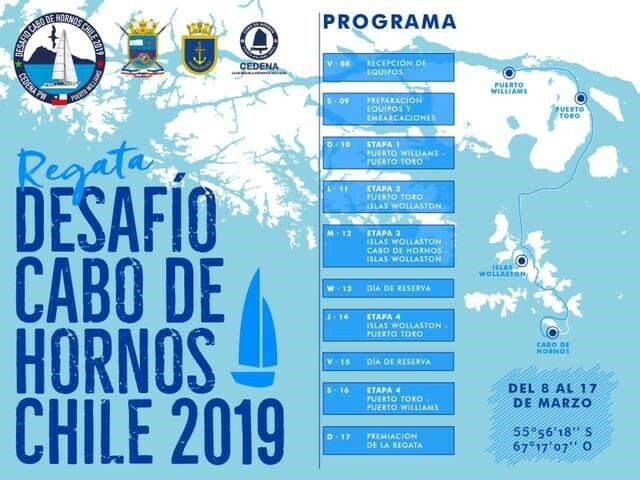 The regatta will celebrate the 500th Anniversary of the Discovery of the Magellan Strait. Details can be found on the OCC Events Page or by visiting the official race Facebook page.